A Letter from Herbert Esquire. 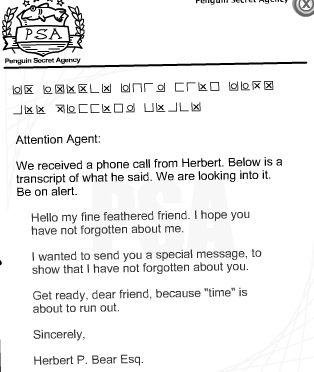 This hidden letter is for secret agents, from PSA leaders, about Herbet Esquire. It shows evidence that he broke the clock at the Snow Forts. Does this mean he wants revenge? Will this lead to the 7th mission? Find out when the time comes to figure out! I'm pretty sure it will lead to the 7th mission, but I might be wrong. Also, I also think this may have caused the clocks breaking down. you get one more chance!!! I cant wait for the new room!! THE NEW MISSION IS OUT! YUP!! And i havent done it yet... :S Lol! Lol, I did. It's sorta hard. Kinda. how did i double post? Subject: Re: A Letter from Herbert Esquire.